A vibrant, square created sapphire is set between the arms of an open, 9ct white gold ring. Finished with elegantly embellished diamond shoulders. A unique ring with a stylish edge. 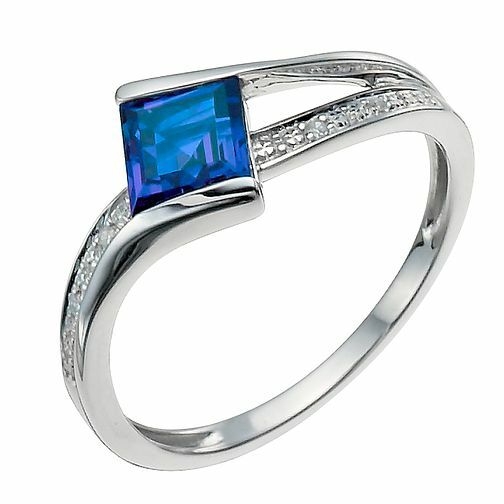 9ct white gold diamond & created sapphire ring is rated 5.0 out of 5 by 5. Rated 5 out of 5 by Anonymous from Celebration of sapphire wedding anniversary This ring is a lovely piece of jewellery. The setting of the sapphire on the diagonal makes it a different type of ring to many sapphire rings which can look like engagement rings , obviously not appropriate when it’s your 45th (sapphire ) wedding anniversary. Rated 5 out of 5 by Anonymous from Stunning I love sapphire and purchased this on a whim for myself. In the scheme of things i consider this to be cheap in price, however it is not cheap in quality. It is simply stunning and is not done justice in the photo, I am delighted with this ring. The sapphire is created so you can content yourself that it is ethical, it is the most brilliant vibrant blue which matches the hue of another natural sapphire ring that i own and the overall design is classic, subtle and chic. Fabulous!